Digital banking refers to the digital technologies that now banks are providing instead of traditional banking. The objective of digital banking is to provide a standard as well as comfortable online and mobile banking services by integrating their digital technologies. Now, for getting your balance update, fund transfer, to deposit or withdraw cash, for passbook update you need not to visit your branch. For each query, there is a machine-like CDM (Cash deposit machine), Passbook machine, ATM etc. Digital banking is not only for customers but also for bankers, they are using CSM (cash sorting machine) for cash-counting, Digital lamps for cheque verification, enhanced software’s for calculations and data storage, they use different software’s to update their all inventories of bank-like cheque books, account-opening kit, debit-credit cards, locker details etc. If financial entities want to survive the digitalization of their industry, and even thrive by taking full advantage of the new paradigms, they must pursue six high-priority objectives. Develop consumer-centered business models, including a digital experience that differentiates them from the competition and that addresses new purchasing behaviors. According to a PWC study, 30% of financial entities believe that improving the user experience is the most important element of their digital strategy. Optimize distribution. The user’s experience needs to be increasingly multi-channel, especially when it comes to online, mobile, and social media. Obtain relevant information. Gaining the capability and the tools required to obtain relevant information from Big Data will be a clear competitive advantage. Invest in security for verifying user identity and for making data and transactions secure. The digital transformation of the financial industry also has its dark side, consisting of obstacles to be overcome. So, what is stopping the banking industry from taking full advantage of the digital revolution? The banks’ own complex, traditional, centralized systems. Lack of talent and/or skills. View balances: Checking your balance doesn’t require much work. You simply select Account balances and take a look at your balance and past transactions. If you have more than one account, you can also do transfers between accounts. Pay bills: To pay your bills online, you just need to add to your account the names of the companies you wish to pay bills to. In the Pay Bills section, select Add payees, search for the name of the company and fill in the account number for each company. You can also sign up for the ebills service from epost, a service that sends you a bill by email instead of a printed one by regular mail. Transfer funds: When you select Transfer Funds, you’ll be asked where to transfer the money to and from, when, and the amount. Set up recurring bill payments or transfers: If you make a regular payment every month, it might be convenient to set up an automatic withdrawal from your account. Monitor CIBC investments: If you have any CIBC investments, you can keep an eye on those stocks or mutual funds here. Send and receive an INTERAC e-Transfer: This could be the end of the birthday cheque! You can receive transfers from other people’s accounts, or set up transfers from your account to someone else’s. The recipient will get an e-mail notifying them of the transaction. View CIBC VISA accounts: Always a good place to monitor your spending. You can make your credit card payments online, right from your account. Order cheques: We don’t need them much anymore due to online banking and debit purchases, but if you still use cheques, you can order them directly from the CIBC website. When you do your banking activities through the internet with the help of laptop or personal computer without visiting a bank branch. You can avail any type of banking services like – Fund transfer, Bill payment, Check account balance, etc. It is just similar to an internet banking. Without the help of laptop and computer, a customer can perform all banking activities through a mobile phone. With the help of mobile app of a particular bank and internet, you can either transfer fund or pay your bills, etc. It is a centralized system developed by a bank which allows its customers to conduct banking activities from anywhere and any branch of the bank. A customer can avail banking services from any branch of the bank which is on CBS network irrespective of a branch you have opened your account. For e.g.- If you have an account in SBI Bank of Noida Sector 19 branch and you are currently staying in Lucknow. If you wish to transfer money to someone then you can visit any SBI Bank branch of the city (Lucknow) and can easily transfer the money. It is a payment system which facilitates one-to-one funds transfer. Under this facility, any customer can electronically transfer funds from any bank branch to any individual, firm or corporate having an account with any other bank branch in the country. Transaction Limit: There is no minimum & maximum limit of amount. Note: For cash-based remittance and remittance to Nepal - the maximum amount per transaction is limited to Rs 50,000. Timing: At present, NEFT operates in hourly batches - there are twelve settlements from 8 am to 7 pm on weekdays (Monday through Friday) and six settlements from 8 am to 1 pm on Saturdays. Under this facility, the transfer of funds is done individually on an order by order basis (without any delay). The RTGS system is primarily meant for large value transactions. ‘Real time’ means – The processing of instructions at the time they are received rather than at some later time; 'Gross Settlement' means the settlement of funds transfer instructions occurs individually (on an instruction by instruction basis. Transaction Limit: The minimum amount is Rs. 2 lakh. There is no upper ceiling for RTGS transactions. Timing: The RTGS service window for customer's transactions is available to banks from 9.00 hours to 16.30 hours on weekdays and from 9.00 hours to 14:00 hours on Saturdays for settlement at the RBI end. However, the timings that the banks follow may vary depending on the customer timings of the bank branches. It is an 11-digit alpha-numeric code which identifies a bank-branch participating in the NEFT & RTGS system. IFSC is used by the NEFT system to identify the originating / destination banks/branches and also to route the messages appropriately to the concerned banks/branches. Last 6 characters indicate – bank branch. For e.g.- SBIN0000125 – Here – SBIN indicates – State Bank of India. 0125 represent the Lucknow Main Br. name. National Payment Corporation (NPCI) is identified to act as Bharat Bill Payment Central Unit (BBPCU) which will be a single authorized entity for operating the BBPS. The biggest advantage is that the bill can be paid anywhere and anytime. The system will provide multiple payment modes and instant confirmation of payment. Payments may be made through the BBPS using cash, transfer cheques, and electronic modes. The BBPS outlets would include banks, ATMs, business correspondents, kiosks etc. Unified Payment Interface was officially launched by National Payments Corporation of India (NPCI), under RBI for instant inter-bank real time transactions using android apps. UPI is a payment system that allows money transfer between any two bank accounts by using a smartphone. National Payments Corporation of India is an organisation for all retail payment systems in India which aims to allow all Indian citizens to have unrestricted access to e-payment services. It is owned by a consortium of major banks and has been promoted by Reserve Bank of India. Its recent work of developing Unifi ed Payments Interface aims to move India to a cashless society with only digital transactions. It has successfully completed the development of a domestic card payment network called RuPay, reducing the dependency on international card schemes. The RuPay card is now accepted at all the ATMs, Point-of-Sale terminals and most of the online merchants in the country. More than 300 cooperative banks and the Regional Rural Banks (RRBs) in the country have also issued RuPay ATM cards. BHIM (Bharat Interface for Money – Bhim App) is a Mobile App developed by National Payments Corporation of India (NPCI), based on the Unifi ed Payment Interface (UPI) to facilitate e-payments directly through banks and as part of the 2016 Indian bank note demonetisation and drive towards cashless transactions. 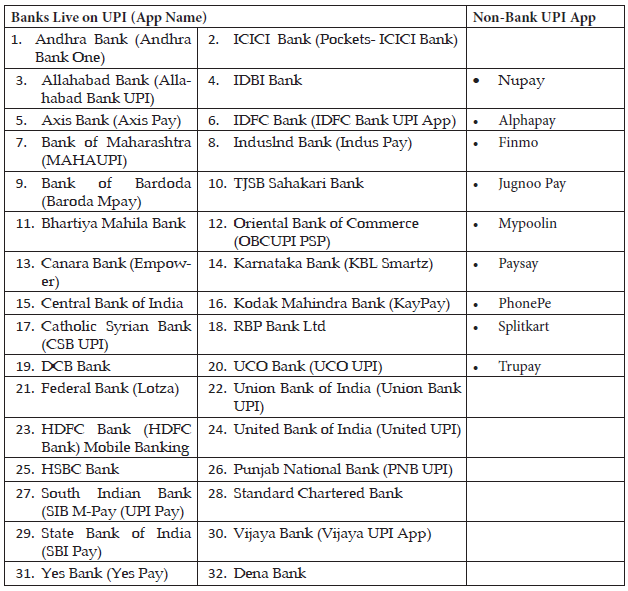 This UPI app supports all Indian banks which use that platform, which is built over the Immediate Payment Service infrastructure and allows the user to instantly transfer money between the bank accounts of any two parties. It can be used on all mobile devices. Mobile Wallet or Digital Wallet or e-Wallet apps allow us to pay electricity bills, mobile recharge, get movie tickets and do a lot more right from your mobile. By linking the Credit or Debit Cards or Bank accounts with these e-Wallet apps, we can easily make a payment using the mobile. Paytm is one of the best digital wallets to make payments. It allows you to add your Credit/ Debit cards and link our bank account to it by use of QR code to send and receive payments easily. PayTM mobile wallet allows us to buy movie tickets, online mobile recharge, pay electricity bills and more from the mobile. It is available for Android, iOS, and Windows Mobile Phone. Mobikwik is another versatile and secured app that allows you to pay or transfer money using the mobile number. It facilitates to make payments for mobile bills, shopping bills and other payments in seconds. It is available for Android, iOS and Windows Phone. FreeCharge e-Wallet allows you to add credit and debit cards which make it easy to make payments. It is the fastest growing digital payment platform allowing you to pay electricity bills, mobile and DTH recharge and more. It helps make online and digital payments securely using mobiles. FreeCharge is available for Android, iOS and Windows Phone. State Bank Buddy by State Bank of India is the fi rst Indian mobile wallet available in 13 Indian languages. Using this sending money, asking reminders to clear dues, instant bill payments and more from your mobile is possible. State Bank Buddy mobile wallet helps to do so by linking your credit or debit cards to it. It allows you to load amount into your wallet and make payments to your contacts on phone book. It is available for Android and iOS. PayZapp from HDFC bank is available to customers of all banks and allows them to make payments with just a single click. You can make payments easily by adding credit or debit card details. Here your card details are safe with the bank and there is no need to worry about that. PayZapp mobile wallet does three security checks for every transaction. It is available for Android and iOS. Pockets app is the fi rst mobile wallet app in India that allows you to bring UPI-based payments. ICICI developed this mobile wallet, and it helps make payments online. You can shop anywhere, pay anyone and bank with ease. It facilitates to transfer money, book tickets, do mobile recharge and more. With just a single click, sending and receiving payments to and from Pocket users is possible. It is available for Android and iOS. LIME is launched by Axis Bank providing payments, banking, and shopping facilities. It is available to both account and non-account holders. Pay your shopping bills, mobile recharge, buy movie tickets and more using LIME mobile e-wallet. With the credit or debit card details, one can make payments through the mobile. It is available for Android. PhonePe from Flipkart Group Company works over Unified Payment Interface. It allows you to make all your payments securely. You can make bank to bank transfers using Virtual Payment Address. As it is a UPI app, there is no need to add details of the benefi ciary account. You can top up your mobile wallet by linking it to your bank account that allows you to transact maximum up to 1 lakh rupees. It is available on Android phones. Airtel Money wallet was launched by Airtel Payments Bank. Make payments, do mobile recharge and transfer money to any bank account using this mobile wallet. Banking and remittance services are supported by Airtel Money. It is available on Android, iOS and Windows Mobile Phone. Ola Money allows you to make payments for all your daily needs. Recharge Ola Money wallet using your credit/debit card or net banking. Keep track of your transactions by looking at transaction history. Paying for the Ola and other cabs also made easy using this mobile wallet. Ola Money mobile wallet helps you to transfer money. It is available on Android and iOS.